The web has over 470,00 citations related to urban myths. You can go to many of them and find out that some wild story you've heard is in fact bogus. But the ones on rural mythology deal more with literary matters and information about Norse gods, not crazy stories from the heartland. So I had no place to go to prove to my husband that I hadn't completely made up one of the classic myths of my childhood. I had to rely upon another source -- actual people, rural people. "Don't cross your eyes because if someone comes up and hits you in the back of the head they will get stuck that way". When you're little the thought of people lurking around waiting to find someone with crossed eyes so they can make it permanent doesn't strike you as illogical. So, last summer at a 4th of July party, with my husband near by, I asked and sure enough, every one at the table back in my rural homeland had heard that one. Then they began to offer other ones they had heard. Mostly passed along by older siblings and often created by older siblings. One woman shared that her older five siblings convinced the "little ones" that if you planted rabbit poops the Easter bunny would grow there. So the "little ones" did and watched every day for a fuzzy tail or floppy ear to emerge from their bunny beds. My older brothers created more havoc with their mythology. One told me that if you picked a mole you would die. So as I scratched my little arm one day in the first grade, off came a mole and I went into a complete panic. I couldn't tell the puzzled nun why, but I insisted that I was very sick and they should call my mother right away. I didn't want to die without her. I also couldn't tell the nun why, because even at 6 I knew that there was a small chance that this, like the other 500 crazy things my brothers had told me, was not true. My mother came to get me and I don't even remember what happened after that. She probably explained things quietly to me and not so quietly to my older brother. Some rural myth is regional and some familial and some just crazy stuff older kids make up to control the little ones. One from my oldest brother kept me out of his room. According to him there was something called white lead that he used with his oil paints and if you breathed it, it would dissolve your liver. As with much mythology there was a grain of truth in it, but to a 6-year-old it was gospel. And so when I even got near his room I held my breath and washed any skin that might have touched anything near his room. Then one evening, as my mother made divinity candy, I took a drink from a little glass, set it down and it foamed. Not realizing that this had been used to measure egg whites for the candy, I was certain I'd been poisoned and went into a panic (yes-another one). This time my mom, who was a nurse, thought that I was going into shock. So they rushed me to the doctor for a shot of something to knock me out. My brothers no doubt got another "explanation". And I grew up to become a child psychologist. Lots of rural mythology had to do with health and the workings of the body. We didn't have as many sidewalks to worry about as our urban cousins, but even we heard, "Don't step on a crack or you'll break your mother's back". Certain members of the community were excellent at predicting the weather by the feeling in their joints. But usually we heard about their predictions after the weather event occurred, "Yup, I knew it was going to rain, my elbow was acting up." I grew up with four older brothers and remember many dinners at which my father told the boys that eating the skins from the baked potatoes would "grow hair on their chest". Even as a little one I understood that this was a metaphor for being strong and healthy, yet I never developed a taste for potato skins. My mother had her own brand of mythology. Some also had to do with health and appearance. But a lot of hers turned out to have more than a grain of truth. She said that she thought she didn't have wrinkles because she didn't hold grudges. Notably, she lived to be 90 with a sweet, smooth face. She consciously tried to maintain a pleasant expression and with that pleasant expression often went the pleasant response, "That's nice." When my mother went on automatic pilot mentally, it was comforting the way she continued to say, "that's nice" to information she could no longer process. I admit that I have absorbed and passed on to my children some of this mythology. Not the part about crossed eyes, stepping on cracks or picking moles. But they have had to listen to my encouragement of a pleasant expression and positive response. They tease me about it now, but someday when I go on automatic pilot mentally, I know that they will be glad for my smile and my pleasant response. Some myth is truth. New Year's resolution? In reverse. Published 6 years ago and worth revisiting every now and then. This time of year a lot of lists are written. Unfortunately, many of the same goals keep appearing on these lists year after year. They often include things that need to be done around the house, home improvement or organization projects. In conducting stress-reduction workshops, I noticed how frequently people mentioned the perennial unfinished project list as a source of stress. Part of the problem in accomplishing the goal is that it appears at the top of the page. We often don't think about the fact that the item needs to be at the bottom of the page with dozens of steps preceding it. It's clearly not as simple as placing the item at the bottom of the page, but that act realizes the truth that the lack of accomplishment is not a character flaw, but a lack of planning. We are not just being lazy or procrastinating - more often we're missing a clear path to the goal. 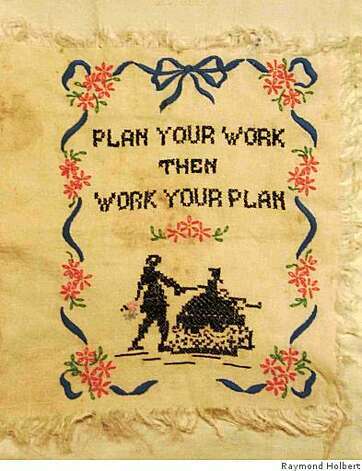 This faulty thinking reminded me of a sampler I embroidered with the phrase, "Plan your work, then work your plan." Most people in the workshops had not really planned their work, even though they were making stabs at it. From that observation I began including an activity in the stress-management workshops that focused on the process of planning one's work. It also recognized the importance of giving a name to all the little obstacles that are between the goal and its accomplishment. I titled the activity the Yabut List and invited participants to work in pairs, but it is not a complicated exercise and can easily be done alone. The directions are simple. First, write the goal at the bottom of a page, then start a series of yabuts, all reasons that the specific task can't be done. Write each yabut down, working your way up to the top of the page by answering each yabut with another. One participant shared her reappearing goal of getting the bathroom remodeled. It started with: "Get the bathroom redone." The first yabut: "Yabut I can't do that until I get the name of a good contractor." So, her partner wrote, "Get the name of a good contractor." The next yabut: "Yabut I can't do that until I call my cousin's neighbor, she had a great outcome." And her partner wrote down, "Call my cousin's neighbor." "Yabut I can't call her until I find the gardening book she loaned me." And her partner wrote down, "Find the gardening book." The process continued with each yabut translated into a step. "Yabut I can't do that until I can get into the garage, where we stored all the books when we repainted the office. Yabut I can't do that until I get my son's car out of the way. Yabut I can't do that until I get the garage door fixed. Yabut I can't do that until I get the number of the garage-door installer." The final step was, "Yabut I can't do that until I get online and find his number." The partner wrote down, "Get online and get the number!" When the exercise was done, the woman had a list of steps to get her started. Little did she realize when she began the exercise that her bathroom remodel hinged on the phone number of the garage-door installer. I don't know if the woman ever got her bathroom remodeled. I do hope that she and the other participants gained a new strategy for chipping away at the annual list by understanding that most accomplishments happen through dozens of baby steps, formerly viewed as obstacles. I'm sure there are people for whom taking down the Christmas tree is just another housekeeping task. But for me it is a ritual filled with sentiment. It is a melancholy process in which all phases of my life participate. There is the little me who wishes we could keep the tree up all year. Trying to persuade my parents to wait just one more week. There is the practical me of now, trying to find the magic way to wind up the lights so that we don't spend hours untangling them next December. The practical me tries to get up all the pine needles so I won't still be picking them up at Easter. And there is the future me, maybe wondering, like my mother did every year from 65 to 85, when might be the last year I'd be putting the Christmas decorations away. I like decorating the tree with the family. It's a lively, social event, but somehow it just feels right to take it down alone. And I don't seem to get a lot of offers of help, so it works out fine. I work slowly, trying to fit more into fewer storage boxes. I try to edit a few nonsentimental items, and I stop to admire some special ornaments. There are the ones showing the goofy smiles of kindergarten, photos framed by glitter and green macaroni. As my mother got older, her decorating for Christmas got more and more elaborate. As I pack things away, I wonder if I'll be that way. Her house at Christmas had an arrangement on every surface. The nativity scene on the mantel. Santa on the buffet. Rudolph on the bookshelf. Once in a while she would say, "I don't know, somehow this year just doesn't feel like Christmas." For me, it felt like Christmas every time I entered her warm little house after my long journey across the country. As I carefully wrap the porcelain choirboys that were once hers and the few ornaments from my childhood trees, I think of her and of the warm and twinkling place she created. And I drift again to the future and to my own children and hope that such warm and twinkling memories will stick with them. When the tree is empty and the storage boxes packed and stowed away in the basement, then someone else can take the tree to the curb, but the job of removing the decorations is mine and one I do reverently. I'm not at the point yet where I give a lot of thought to what might be the last year. Instead, this process is about memory and appreciation and a quiet, solitary ritual -- one in which all the times of my life melt into now. There are some memories to share and some to savor alone. Amid my posts about the season and heartwarming traditions I must post this article from the Christian Science Monitor from over nine years ago. For too many families this time of year just amplifies their tragic loss. The families of Sandy Hook have just brought a law suit. Like the suit brought years ago by my neighbor and friend, I pray that the result is many more people able to celebrate this season in the future with the people they love. BERKELEY, CALIF. — Congress has just passed legislation providing special protection from liability lawsuits for the gun industry. This may seem like a win for people concerned about ridiculous legal claims and outrageous financial awards as well as for the gun industry. One often hears the complaint of "too many frivolous lawsuits." It fits in with the mythic suspicion of trial lawyers and may sometimes be true. But a tragic incident many years ago has given me a clear perspective on this issue. I now believe that when human life is involved, the matter is never frivolous. On our street back then was the dearest 15-year-old boy a neighbor could want, kind to the smaller children and helpful to the older neighbors. This boy was accidentally killed by a friend. His friend wanted to show the gun and first removed the ammunition magazine. He did not realize that a bullet was still in the chamber. He thought he was showing off with an unloaded gun. When the bullet remaining in the chamber discharged, he shattered the life of his friend - and his own. The parents of the child who was killed sued the gunmaker. The contention of the lawsuit was that the absence of an effective way to indicate that a bullet was in the chamber constituted a product liability claim - that being one of the reasons for the boy's death. It has been almost 10 years since the accident. Recommended: Could you pass a US citizenship test? One trial ended with a hung jury, one trial had juror misconduct, and, with the usual workings of our legal system, the last trial was completed just last year. The family lost the case. To some, the decision in favor of the gunmaker may seem like a total loss. But what became apparent is that even bringing a suit can have a powerful impact. During these 10 years there have been significant changes. Three states now have laws that require more safety features, the gunmaker in question now makes guns with a safety feature they originally said wouldn't work, and other manufacturers now make guns with internal locks. These are just some of the concrete and tangible results. Of equal importance are the thousands of people who have read about the case or heard about it on the news and have taken personal steps with regard to their own guns. Maybe they have purchased ones with a prominent chamber load indicator. Maybe now they store their guns unloaded. Maybe they lock them up more carefully. Or maybe, as my friend once said, they simply draw their own children close and realize how blessed they are to see them grow up. My neighbor is a modest, reserved woman. She would never say it, but I hope that she knows that as painful and heart wrenching as these years of litigation have been, the battle has won the lives of many other children. Regret is just part of the job of being a parent, but her struggle has saved many parents from the ultimate regret. Sometimes critics focus on the amount of money in the suit, as if the family is trying to benefit in some way from the loss. Just looking into one's own heart is enough to know that the money is so clearly not the issue. Money is simply the leverage that an individual has in trying to bring about a change in a product or policy - a change that those bringing the suit hope will protect others. The true currency in these matters is not a financial one, but the hope that their loss not be in vain - that a young life lost before it could bring about good in the world can still bring about good. The companies that are sued are in the business to make money and to hold on to that money. It is not remarkable that they wage a battle to maintain their position. Yet many of the people in these companies may know in their hearts that they and their own children are safer because of previous lawsuits. What is remarkable is that there are families willing to put themselves through the reliving of a tragedy and to deal with the suspicions and criticisms to accomplish an outcome that benefits the rest of us. There are no doubt some frivolous lawsuits and ridiculous awards, but for every one of those there is a family who is fighting through their anguish to make sure that others do not have to suffer the same. • Susan DeMersseman is a psychologist and parent educator. I think this piece is worth sharing each year. This and the advice a wise man offered years ago -- to not live in "the kingdom of thingdom." That statement was once said gently by my Grandfather, Ralph Kochenderfer, and repeated for years by other family members. Ralph was a reserved and kind man, but he had his priorities straight. He never missed an event his four children took part in and he would even let them play hooky on good fishing days. With a lunch of oatmeal cookies and cheese they would spend the day by the creek. But Christmas traditions were different. Grandfather was Pennsylvania Dutch with what seemed like a significant Amish streak. A dignified and honorable man he kept all the secrets of his little town in South Dakota. As the railroad depot agent he was the telegrapher in town in the twenties and thirties, so he knew the contents of every message sent and received. While he did not believe in the frenzy over gifts he enjoyed the celebration. The depot waiting room was the largest site in town and every year was the location for wonderful holiday parties – food, music, and spirit provided by everyone in town. I’m grateful that this simple statement became part of the family culture. While others scurry around purchasing for people close and not so close to them, most of us are decorating our homes or arranging little (or sometimes big) parties. There’s a lot of empty space under our tree, but our homes are filled with friends and festivities. My husband and I started early with our own children, not to expect volume. Our family event on Christmas Eve takes very little time for package opening with only a few small thoughtful gifts. Now that our children are grown we give them a little money to add to their savings for a special purchase. And there is sometimes a handmade gift card for a special activity for the family. One year when they were younger we took them for dinner at a nice French restaurant. That experience was so special and memorable it has become a point of reference for them. I just made reservations at the same restaurant and am certain the memory of the upcoming dinner will stay with them longer than anything they could unwrap from under the tree.